Truth be told, Baga beach hasn’t been our favourite hangout in Goa but the serene creek area is changing that. If we have been convinced to head in that direction, it’s probably because of the slew of yummy restaurants that now dot the creek area. Whether it’s enjoying a great gig at The Royal Enfield Garage Cafe or the promise of homely Thangkul pork at Meiphung, we’ve come back happier after a creek drive. And, after having conquered a lot of outposts, we’re here with our list of favourites. From brunches to sundowners, Toro Toro keeps giving us more reasons to go back. Not only does it win big in the looks department (that caravan bar is so cool), it does some decent pizzas too. Their sushi and innovative, fruity cocktails are quite the stars. We like to pair our drinks with the Pulled Pork Bruschetta and the mezze platter and love that we can take our doggos along because they’re pet-friendly. With a mini workshop, a merch store and a cafe, Royal Enfield has garnered so much of love from the biking community. They host regular music gigs and have used all the space they’ve got with indoor and outdoor seating so you’re sorted in all seasons. Grab a creme de caramel and coffee or get yourself some locally brewed Susegado beer with prawn curry, they’ve got enough variety between Italian, Goan, salads and more. We really dig their wood-fired pizzas and pan seared prawns though. 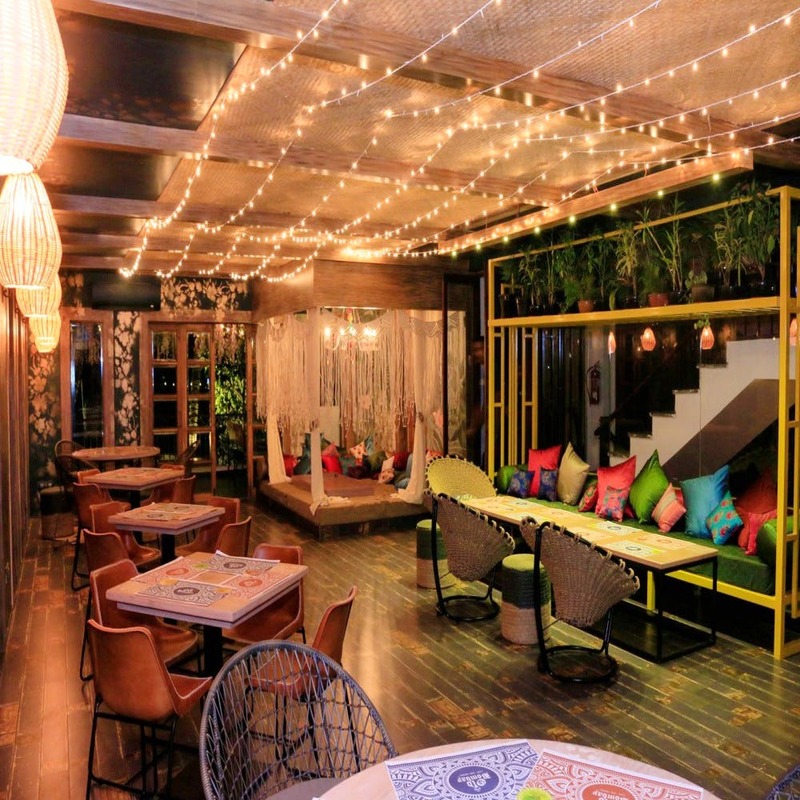 The newest baby on the creek is this hard-to-miss restaurant that comes from the guy behind brands like Townhouse, Bombay Bar and Unplugged Courtyard in Delhi. With such backing and experience, it’s no surprise that the cafe has won Goan foodies’ and holiday makers’ hearts. The gorgeous boho ambience combined with cute balconies with cascading flowers and berry pulao makes this one a winner. Try their unique dishes that are a mix of nostalgia rendered in new formats. Think Kadhi Chawal risotto and Koli Vada fish and chips. Overlooking the Baga river, this one’s as much a day place as a night hangout. Having gathered a fair share of love from the locals as well as tourists, this is one place that surprises you with its authentic North Eastern and Thai preparations. It’s really a breath of fresh air when you’re done with the shacks and craving a change of seasoning. Try their Singju, Tankgkhul pork, momos and Pumpkin chicken. Wash it all down with rice beer. On Sundays, they have live music too. This one’s on the fag end of the creek and is one of those quiet, romantic dinner places you can’t go wrong with. The views of the creek are beautiful and the cocktails are to die for. Their insistence of using seasonal produce means that they whip up a new menu every now and then. We also love that they have ample choice for both vegetarians and meat-eaters. Our picks from the menu: Patatas bravas, cauliflower popcorn, paneer steak and crispy fried coconut prawns. They have a set candlelight dinner menu and also vegan options, because, they’re nice and thoughtful like that. Situated right by the lazy river, this one’s for folks on the lookout for cheap wine and a scenic, rustic set-up. With a menu that tries to please everyone, this one has a mish-mash of Indian, Chinese, Goan and Continental. The place looks serene in the day, perched right on the bank on the stream and at night, it’s decked with fairy lights. If we were you, we’d stick to the Indian fare (pakoras and naan are delish) or max give Goan or seafood a shot. The staff is warm but the service is a tad slow sometimes. Go here if you’re an accommodating, broke traveller who loves a pretty cafe.